The Nestle Nutrisource Fiber Unflavored Powder Supplement 4g Case of 75, Model #4390097648, is anchored in advanced science and research. Nestle Healthcare Nutrition offers nutritional solutions for people with specific dietary needs related to illness, disease states or the special challenges of different life stages. 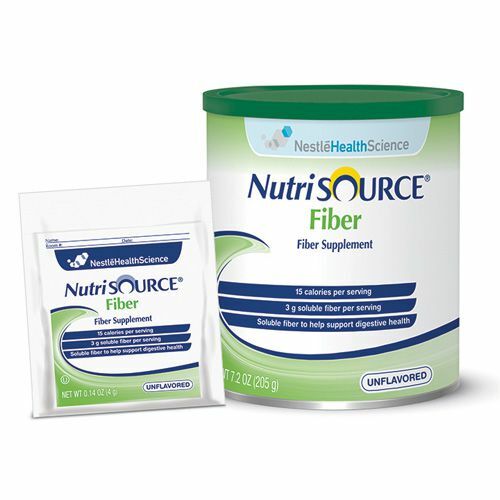 The Nestle Nutrisource Fiber Unflavored Powder Supplement 4 g Case of 75 provides 3 grams of soluble fiber from 100% partially hydrolyzed guar gum (PHGG) to help support digestive health and normal bowel function. Nutrisource fiber can be mixed into juice, milkshakes, smoothies, pudding, gravy, soup sauces, or casseroles. For use under medical supervision. Provides soluble fiber to help support digestive health and normal bowel function. Will not compromise taste or texture of food or beverages. Can be added to juice, milkshakes, pudding, gravy, soup, sauces, or casseroles. This is only appropriate for use in individuals greater than 3 years old. Ingredients: Partially Hydrolyzed Guar Gum..
May contain Milk, Egg and Soy Ingredients.